H. Rick Bamman - hbamman@shawmedia.com McHenry's Madisyn Kaempf tries to save the ball from going out of bounds in the first half against North Chicago in the 26th Annual Northern Illinois Girls Holiday Classic at McHenry High School on Monday, Dec. 22, 2014. H. Rick Bamman - hbamman@shawmedia.com McHenry's Abby Ross, (left) and Kaleigh Johnson wait to enter the game against North Chicago during the 26th Annual Northern Illinois Girls Holiday Classic at McHenry High School on Monday, Dec. 22, 2014. H. Rick Bamman - hbamman@shawmedia.com McHenry's Kaleigh Johnson is double teamed by North Chicago's Kylah Collins (12) and Ladellia Maggett (23) in the first half during the 26th Annual Northern Illinois Girls Holiday Classic at McHenry High School on Monday, Dec. 22, 2014. 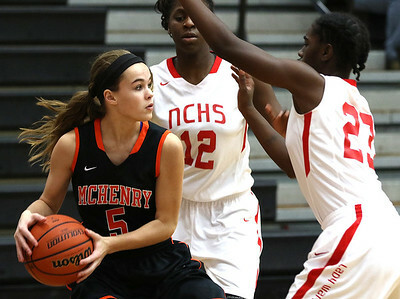 H. Rick Bamman - hbamman@shawmedia.com McHenry's Carly Mattson drives past North Chicago's Ladellia Maggett in the first half during the 26th Annual Northern Illinois Girls Holiday Classic at McHenry High School on Monday, Dec. 22, 2014. H. Rick Bamman - hbamman@shawmedia.com McHenry's Alexandria Martens is cheched by a North Chicago defender in the second quarter during the 26th Annual Northern Illinois Girls Holiday Classic at McHenry High School on Monday, Dec. 22, 2014. 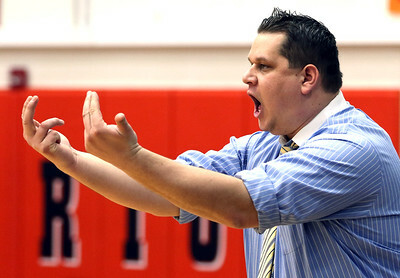 H. Rick Bamman - hbamman@shawmedia.com McHenry's girls basketball head coach Rob Niemic reacts to play on the court in the first quarter during the 26th Annual Northern Illinois Girls Holiday Classic at McHenry High School on Monday, Dec. 22, 2014. 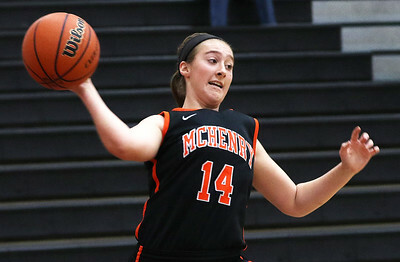 H. Rick Bamman - hbamman@shawmedia.com McHenry guard Lindsey Skinner defends against North Chicago in the first hald during the 26th Annual Northern Illinois Girls Holiday Classic at McHenry High School on Monday, Dec. 22, 2014. 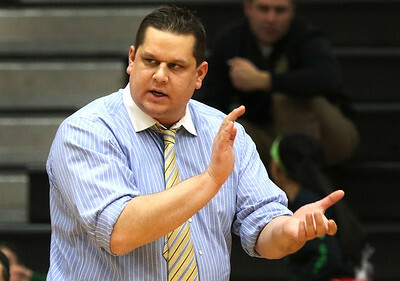 H. Rick Bamman - hbamman@shawmedia.com McHenry girls baskeball head coach Rob Niemic encourages his players in the first half against North Chicago in the 26th Annual Northern Illinois Girls Holiday Classic at McHenry High School on Monday, Dec. 22, 2014. H. Rick Bamman - hbamman@shawmedia.com McHerny's Julia Rice (left) as the ball taken away by North Chicago's Alexis Means in the second quarter during the 26th Annual Northern Illinois Girls Holiday Classic at McHenry High School on Monday, Dec. 22, 2014. 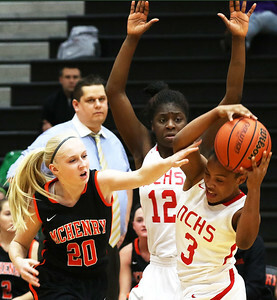 North Chicago's Kylah Collins (12) defends as McHenry coach Rob Niemic watches for the bench. 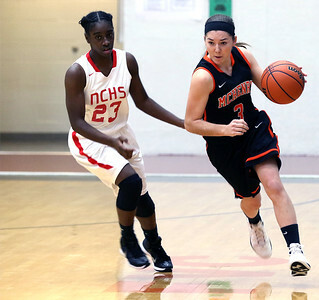 McHenry's Carly Mattson drives past North Chicago's Ladellia Maggett in the first half during the 26th Annual Northern Illinois Girls Holiday Classic at McHenry High School on Monday, Dec. 22, 2014.